This video made both me and L.bo Marie cry. She because the music is so affecting. Me because comparing their fresh-faces to my craggy, careworn flesh reminded me that my death is but a blink away. Two things to bear in mind before you set out on this one. Firstly, he’s tuned down half a step to f# B Eb Ab. 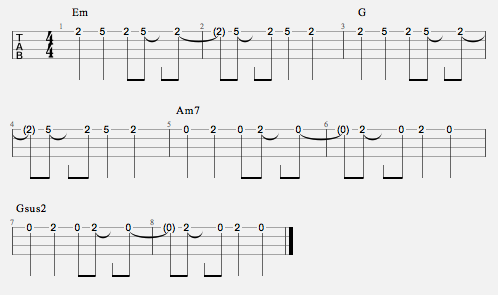 Secondly, I’ve simplified some of the chord names in the sheet. Technically the Em11 is Emadd11 and the F#m is F#maddb9. The fancy bit in the chorus (shown at the bottom of the chord sheet) pretty much combines that with the chords.